Three books of travel writing (between them covering the USA, Canada, Japan and Egypt) by the Nobel Prize winning author of the Just So Stories and the Jungle Book. 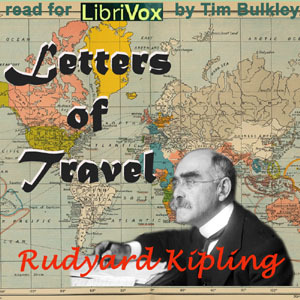 Rudyard Kipling (an Englishman born and raised in India) offers an interesting outsider's view of the places he visits, candid and sharp witted, yet with a deep humanity. Letters of Travel comprises three books: From Tideway to Tideway 1892-95 contains pieces first published in the Times covering voyages across north America (USA and Canada) and in Japan; his Letters to the Family first appeared in the Morning Post, while Nash's Magazine was the first publisher of the articles (on Egypt and Sudan) in Egypt of the Magicians. A paragraph in the "letter" written on Kipling's arrival in Japan might serve as example. It closes: "The father-fisher has it by the pink hind leg, and this time it is tucked away, all but the top-knot, out of sight among umber nets and sepia cordage. Being an Oriental it makes no protest, and the boat scuds out to join the little fleet in the offing." With its flippant tone ("all but the top-knot"), impersonal reference ("it" rather than he or she) and use of racial terms ("Oriental") and stereotypes ("makes no protest") this can be presented as an example of the worst of Victorian Imperialist prejudice. And yet... as the fisher family are introduced, not only was "the perfect order and propriety of the housekeeping" noted but mention was made of "a largish Japanese doll, price two shillings and threepence in Bayswater", which turns out to be a baby. At first glance this is merely another example of Western bigotry. Note however the words Kipling uses to show us that this is not in fact a doll: "The doll wakes, turns into a Japanese baby something more valuable than money could buy". The "Japanese doll" is a priceless human child and not a commodity to be bought in Bayswater.